A macaque took this self-portrait in 2011 with a camera owned by photographer David Slater. PETA says the monkey owns the copyright; Slater says he does. The U.S. Copyright Office says no one can, and a federal judge has now said it would be up to Congress to extend copyright privileges to animals. 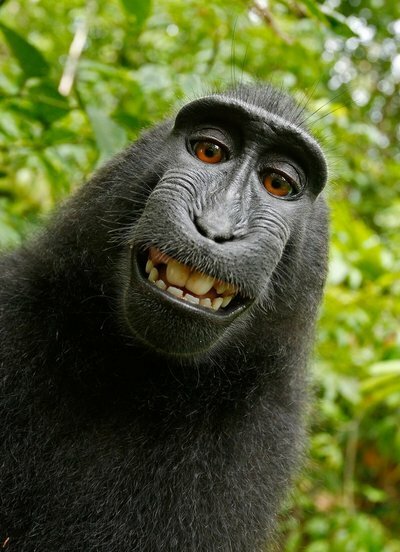 The legal saga of the monkey selfie continues: On Wednesday, a federal judge said the macaque who famously snapped a picture of himself cannot be declared the owner of the image&apos;s copyright. At least, until Congress says otherwise. There&apos;s "no indication" that the Copyright Act extends to animals, U.S. District Judge William Orrick wrote in a tentative opinion issued Wednesday in federal court in San Francisco. "I&apos;m not the person to weigh into this. This is an issue for Congress and the president," Orrick said from the bench,according to Ars Technica. "If they think animals should have the right of copyright they&apos;re free, I think, under the Constitution, to do that." The photo in question was taken in 2011 on the Indonesian island of Sulawesi, with a camera owned by nature photographer David Slater. But Slater didn&apos;t trip the shutter: the macaque did. As a result, some outlets — including Wikipedia — maintain that no one owns the copyright to the photo, and have been using it as an image in the public domain. The People for the Ethical Treatment of Animals filed a lawsuit last year on behalf of the monkey — which it calls Naruto — arguing that in fact Naruto owns the copyright (which PETA is offering to administer on the monkey&apos;s behalf). The U.S. Copyright Office, since the dispute began, has specifically listed "a photograph taken by a monkey" as an example of an item that cannot be copyrighted. Slater, meanwhile, has a British copyright for the photo, which he says should be honored worldwide, The Associated Press reports. He asked the court to dismiss PETA&apos;s claim. "The only pertinent fact in this case is that Plaintiff is a monkey suing for copyright infringement," Slater&apos;s lawyer wrote. "[I]magining a monkey as the copyright &apos;author&apos; in Title 17 of the United States Code is a farcical journey Dr. Seuss might have written." "If the humans purporting to act on Plaintiff&apos;s behalf wish for copyright to be among the areas of law where non-human animals have standing, they should make that dubious case to Congress — not the federal courts," the lawyer continued. And Judge Orrick appears to agree — not necessarily with the Seussian nature of the claim, but with the argument that it&apos;s up to Congress to make this call. "Jeff Kerr, general counsel for PETA, said the organization will continue fighting for the monkey&apos;s rights.
" &apos;Despite this setback, legal history was made today because we argued to a federal court why Naruto should be the owner of the copyright rather than been seen as a piece of property himself,&apos; Kerr said. &apos;This case is also exposing the hypocrisy of those who exploit animals for their own gain.&apos; "